HAF, SECTOR-12, POCKET-D, DWARKA, NEW DELHI. 1 —- 7/10/10 —7 P.M. onwards ——-Recitation: Group –A, Group-B, Group—C. 3—–10/10/10 —11 A.M onwards ——Drawing competition: Group –A, Group-B. SHANKHA DHANI & ULUDHANI COMPETITION. 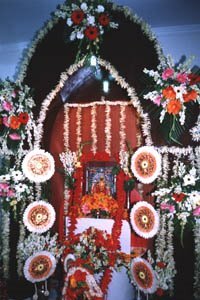 The Dwarka Kalibari, a socio- cultural institution was formed in June 2003 and is registered under the Societies Act (XXI)OF1860 with Regn no: S/46234 of 2003. Formed with the vision of providing a forum for the various social, cultural, religious and philanthropic activities in Dwarka, the institution has been witnessing encouraging response and support. Over the years it has become a socio- cultural center of Dwarka.